And Plan For An Alternate Reality. 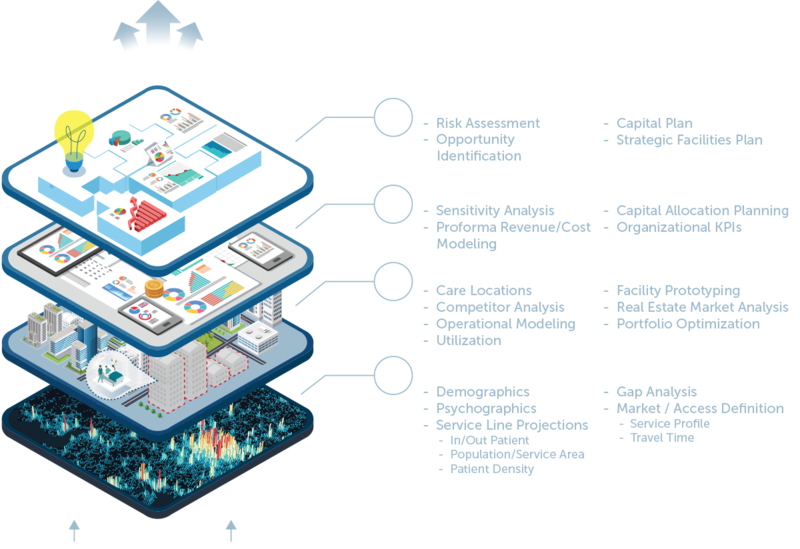 Pivotal is a dynamic business planning and strategic optimization cloud platform for healthcare business decisions. 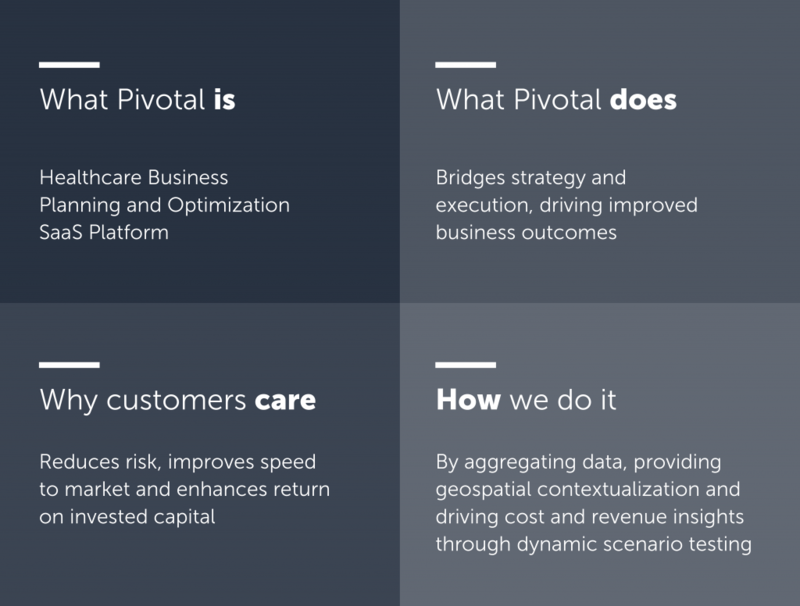 Pivotal was developed for the constantly changing world of healthcare business decisions. It’s a living tool built to help you visualize the success you plan for today, the challenges you should avoid tomorrow, and the opportunities you never saw coming. But most impressively, it’s simple, dynamic, and once the inputs are set, changes are as easy as the drop of a pin. The culmination of Pivotal’s demand, capacity, and financial feature-set is the Studies Options Scenarios (SOS) framework, a system for organizing information, promoting collaboration, and facilitating the evaluation of multiple alternatives. It allows you to define the scope of your evaluations, configure your strategic options within the platform, and optimize and investigate those options, drawing upon layers of dynamic market data. A growing consumer base, an aging population, and a competitive landscape present complex challenges to identifying current and projected service demand. 1) Identify the competition’s locations and capabilities to inform strategy. 2) Enable your team to dynamically monitor current and future demand for care services within the communities you serve. 3) Layer multimodal travel time analysis on top of consumer behavior profiles to accurately predict patient flows and estimate accessibility. Are you meeting the needs of the communities you serve? Explore the current and projected demand for care services to accurately predict if your care teams and their supporting facilities are sufficient to serve the needs of your customers. 1) Employ Pivotal’s SOS framework to pinpoint opportunities within your current facilities portfolio to increase capacity. 2) Identify utilization rates at the campus/building/floor/department/room level 3) Adjust operational models to discover efficient team structures, improve care quality, ensure patient safety, and maximize throughput. 4) With little effort test options for future service demand 5, or 10, years out. What are the financial implications of proposed options?​ Providing the best care can be expensive, and capital is precious. Understanding the potential revenue and total cost of care allows you to… 1) Align projected demand with capacity to identify opportunities. 2) Sync opportunities with financial implications to identify the best capital investments. 3) Employ Pivotal’s dynamic framework to test various capital investment options and their potential outcomes prior to committing to a strategic initiative. As an integrated team of multidisciplinary specialists, we leverage your existing data sources to create remarkable, strategy-driven, business justified solutions for our Healthcare clients. For 34 years, we have built a practice to support our clients through numerous market evolutions.